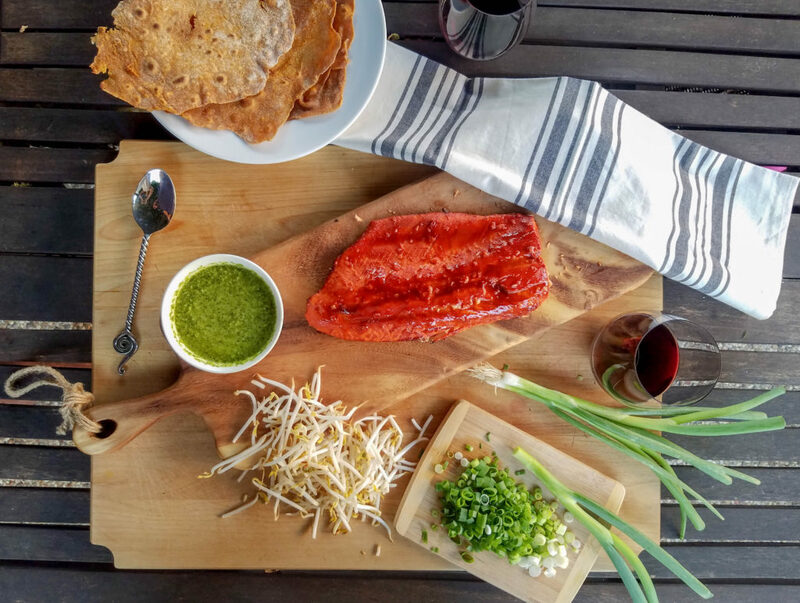 A bright, tangy mint sauce is the perfect compliment to the spicy tamarind and red chile glaze on this grilled salmon. 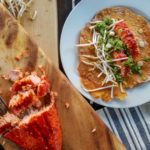 Layered on homemade sweet potato tortillas along with crunchy bean sprouts and green onions this dish has a delicious complexity of flavors in every bite. When creating meals in my head I sometimes start with the setting; do I want an alfresco dinner made on the grill and enjoyed on the patio, an elegant dish at the dining room table with a special bottle of wine or something easy and comforting we can eat on the couch while binge watching our favorite show? My thoughts then move to the particular flavors I’m in the mood for. Am I craving earthy and spicy notes like in Indian food or something pungent and bright like Thai. 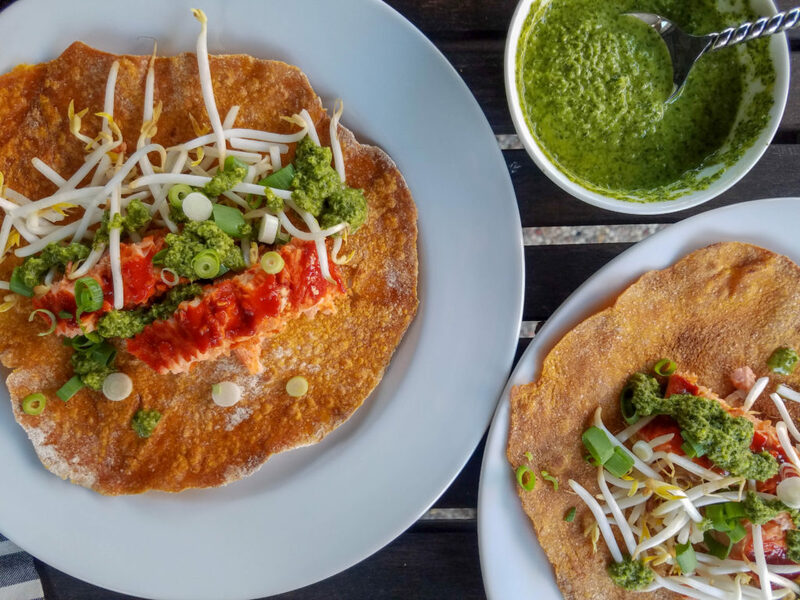 This particular meal happened to get it’s inspiration from both; the tamarind and the mint sauce are a nod to Indian flavors while the gochujang paste in the salmon glaze and the bean sprouts are ingredients commonly found in Asian foods. The basis of this meal was born one Saturday morning when I whipped up some pumpkin tortillas we ate simply smeared with butter alongside our morning coffee. Later that same day, as I was thinking about what to make for dinner, I considered the gorgeous weather and decided I wanted to be outside as much as possible so I settled on grilled salmon. I wasn’t in the mood for the standard accompaniments to grilled fish so I began thinking of the more intense flavors found in Indian and Thai food. 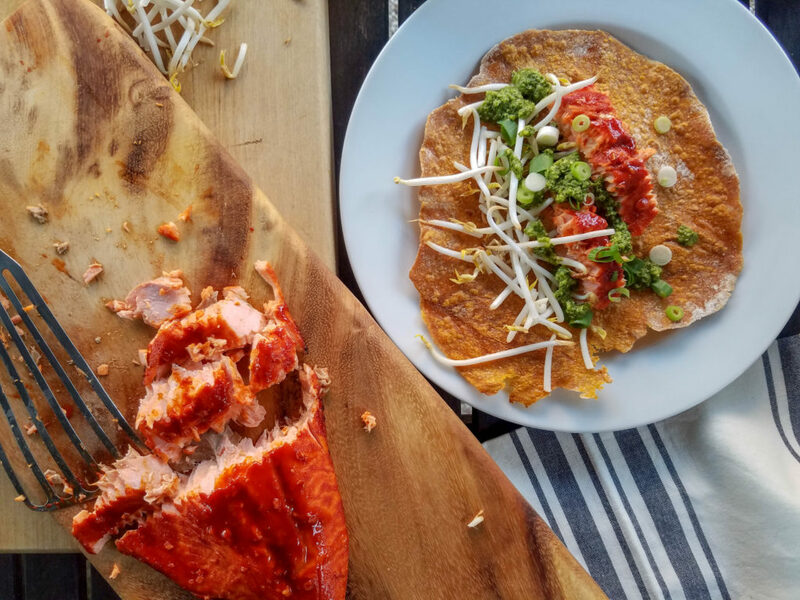 The tartness of tamarind, the bright mint sauce with it’s cooling properties juxtaposed with a slight heat and sweetness of the Korean chile paste, gochujang, and how well a tangy glaze made from tamarind and gochujang would compliment the rich, flaky salmon. I thought of the tortillas I’d made for breakfast and how well their subtle sweetness would complement all these flavors. Continuing to assemble these salmon tacos in my head, I added bean sprouts and green onions for texture and another pop of flavor respectively. Once dinner time rolled around, the tortillas I’d made that morning had dried out a bit so they actually made better tostadas than tacos but I’ve made them since with fresh tortillas and they work well as tacos. If you want to make them ahead of time, try wrapping the warm tortillas in a clean kitchen towel and storing them in the refrigerator until ready to use. Just before serving, bring them to room temperature or warm them for just a few seconds on the grill. Eat them however you’d like – as tacos, tostadas or even piling the sprouts, onions and mint sauce on top of the salmon and serving the sweet potato tortillas on the side. Whatever method you choose, I think you’ll agree there’s something delightfully pleasing in the way all these flavors come together. The tortillas can be made with sweet potatoes, pumpkin or other starchy gourd flesh. I’ve made them using leftover sweet potatoes and even canned pumpkin (just make sure you get 100% pumpkin, not the pie filling). Come next fall I plan to try them with acorn or kabocha squash. Feel free to play around with the type of flour too, I’ve tried both sprouted wheat flour and brown rice flour and I think buckwheat would be a nice substitution as well. Although there are several components to this meal, it’s not as difficult as it may appear and it all comes together in under an hour. A few notes which I’ll include in the recipe below: If using leftover sweet potatoes warm them slightly as the cold tends to make the tortilla less tender. If you’re having trouble with the tortillas sticking when they cook you can use a little bit of oil, but as you become proficient at making them you should find you don’t need it. This recipe makes about 6 tortillas, they stay fresh wrapped in the fridge for a few days and are delicious warmed with cinnamon butter for breakfast. Gochujang is a Korean red chile paste you can find in most well-stocked grocery stores. You can also substitute brown sugar for the coconut sugar. 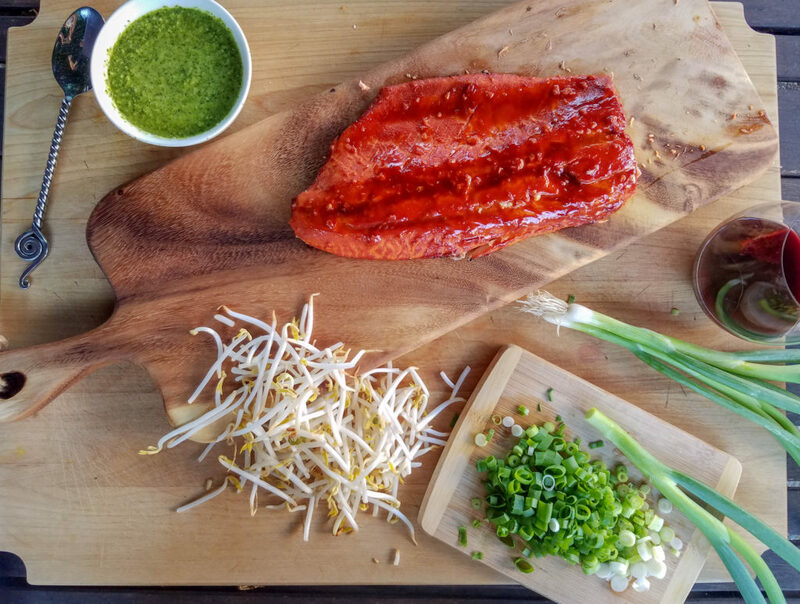 A bright, tangy mint sauce is the perfect compliment to the spicy tamarind and red chile glaze on this grilled salmon. 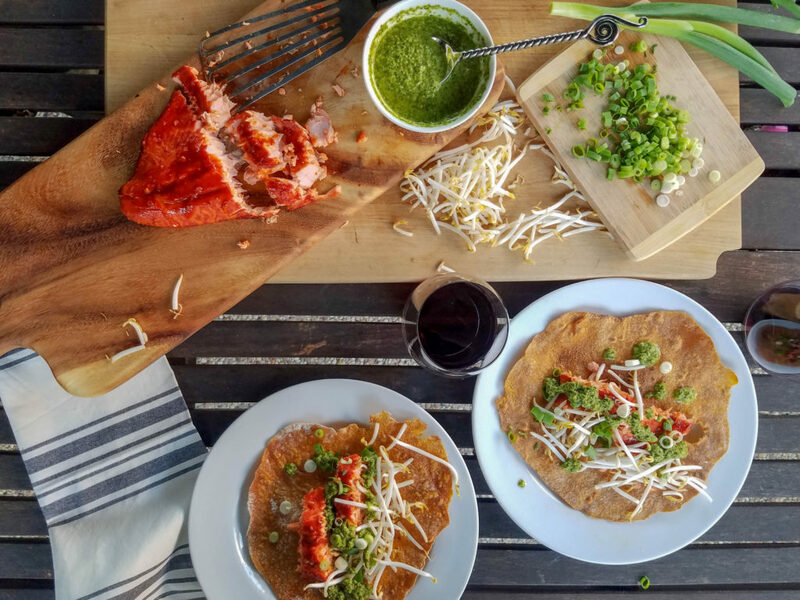 Layered on homemade sweet potato tortillas along with crunchy bean sprouts and green onions this dish has a delicious complexity of flavors in every bite. For the glaze mix the lemon juice and coconut sugar in a small bowl. Add the tamarind paste, gochujang and garlic and stir well. Remove any bones from the salmon, wash and pat dry. Spread the glaze evenly over the top of the salmon. Place the salmon on the grill, skin side down. Close the grill and let the salmon cook about 5 minutes before first checking to see if it’s done. When it’s done the meat should be opaque and just starting to separate at the top. If it’s not quite ready, turn the heat down to medium and recheck every 2 minutes. When it’s done slide a spatula between the skin and the bottom of the fish, it should separate easily. Remove the salmon to a plate and serve it with the mint sauce, beat sprouts, sliced green onions and tortillas. 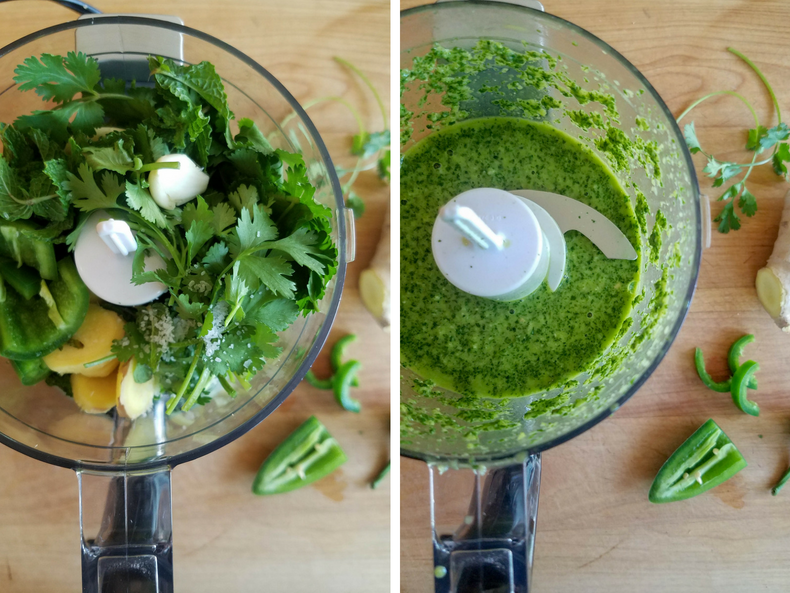 Add all the ingredients, except the water, to a blender or food processor and puree until blended, scraping down the sides once or twice. Taste and add more salt if needed. If the mixture is too thick add water 1 tablespoon at a time until you’ve reached the desired consistency. Add the flour and the sweet potato to a bowl and mix well with a fork. Once mixed together, coat you hands in flour and work the dough into a smooth ball, taking care not to over work the dough or it will get more sticky. Roll the dough into a log and cut into 6 segments. Again, with your hands coated in flour roll the segments into 6 balls. Roll each ball out into a circle, using flour as necessary to prevent them from sticking to the surface but don’t use too much flour as it can cause the dough to become tough. Heat a flat skillet to medium heat and cook the tortillas, one at a time, about 2 ½ minutes, flipping every 30 seconds or so until done. If using leftover sweet potatoes warm them slightly as the cold tends to make the tortilla less tender. If you're having trouble with the tortillas sticking when they cook you can use a little bit of oil, but as you become proficient at making them you should find you don’t need it. This recipe makes about 6 tortillas, they stay fresh wrapped in the fridge for a few days and are delicious warmed with cinnamon butter for breakfast. 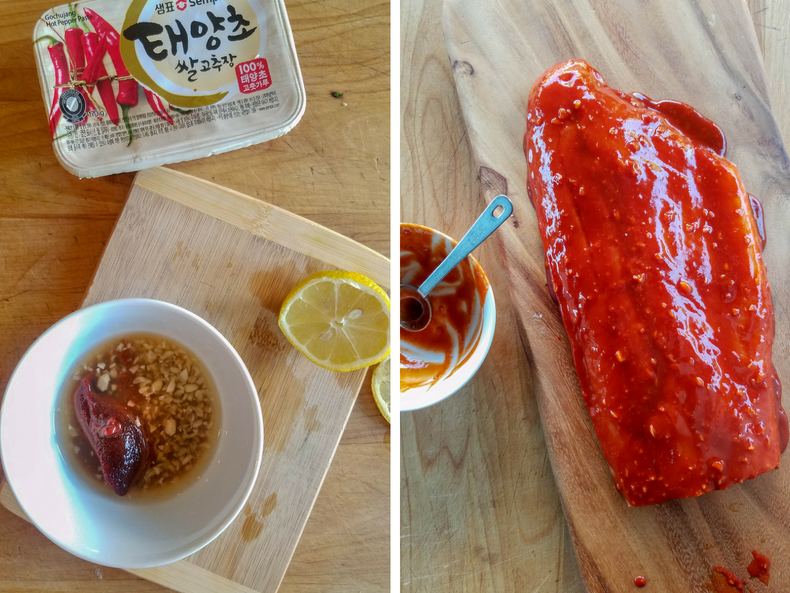 Gochujang is a Korean red chile paste you can find in most well-stocked grocery stores. You can also substitute brown sugar for the coconut sugar.